People hate IE6; they’ve made that abundantly clear on the web. Unfortunately, plenty of people are still stuck using it for reasons such as their work not letting them upgrade. So Google is doing something about it. Chrome Frame is a new browser plug-in developed by Google to give you a Chrome browsing experience inside of Internet Explorer. Let me restate that slightly to make it more clear: Chrome Frame turns IE into Chrome. Yes, it’s both hilarious and awesome (or hilariously awesome, if you will) that Google seems to dislike IE so much that it has spent its own time improving it. Google claims its goals are noble. Talking to Group Product Manager Mike Smith and Software Engineer Alex Russell, they tell us that they simply want to make a more seamless web experience for both web users and developers. That said, they are only targeting one browser, IE, right now. So how does this work? Basically, it’s just a plug-in that creates a new frame inside of IE that is the Chrome browser. The plug-in itself is lightweight (around 500K or so, I’m told), but then it must download around 10 MB of Chrome-related data to work correctly on a machine. The look will be so seamless that a user shouldn’t realize they’re not simply browsing with their regular old version of IE, albeit a much faster and more compliant one, I’m told. While it is obviously more system-intensive to run two browsers rather than one, I’m told that the overall difference is pretty small since Chrome is designed to give resources back to your machine when you’re not using them with the browser. In terms of promotion of Chrome Frame, Google says that while it won’t be explicitly advertising it, it will use subtle methods to alert users to its existence. For example, if you browse to a Google app in Internet Explorer that may render better in Chrome, Google might have a message on the page telling you about the plug-in. The hope is that other developers will use similar messages on their pages. Many already do something like this to tell users to upgrade their browser, but again, this is just a plug-in, rather than requiring you to install a whole new browser. It’s pretty ingenious. Smith and Russel wanted to make it clear that this plug-in, which is still technically in the testing phase, is just as much for developers as for web surfers. They know all too well the pain of having to design sites specifically for IE’s “quirks” and hope a tool like this can make the web a smoother and easier to develop for environment. To target the Chrome plug-in for IE, developers simply have to insert a meta tag in their HTML code. If Chrome Frame isn’t found, the page will render just as it normally would in IE. 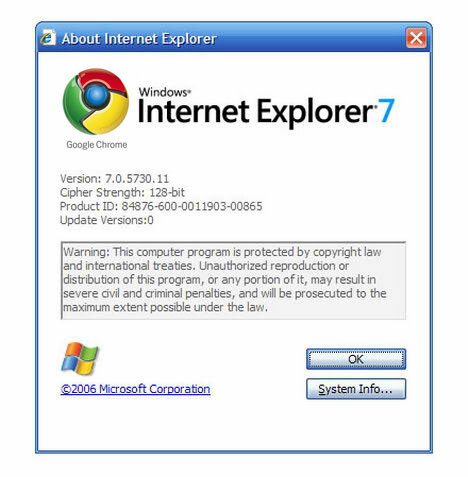 Chrome Frame will work with IE6, IE7, and IE8 on any Windows-based machine. I cannot wait to see Microsoft’s reaction to this. This isn’t quite the nuclear bomb that the Chrome OS revelation was, it’s more like a smart bomb. You can find Google Chrome Frame here. And learn more in the video below.